Contemporary and traditional Indigenous art will light up Alice Springs from 23 September to 2 October 2016 in the inaugural Parrtyeme Festival in Light. Parrtyeme, taken from the Arrernte word ‘parrtma’ meaning ‘light up’, will be the first authentic Indigenous light festival of its kind in the world. 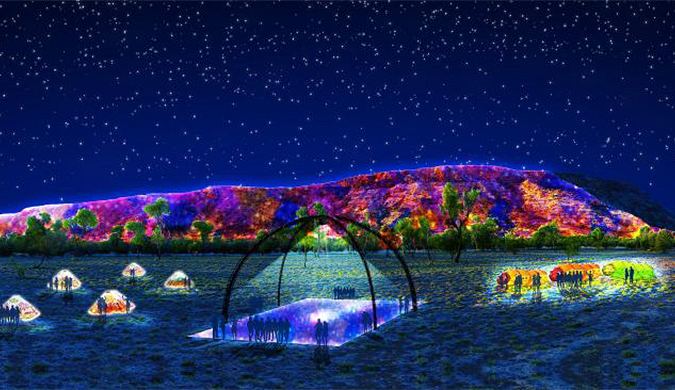 The show will feature Australia’s biggest-ever light installation with more than 2.5km of the MacDonnell Ranges being illuminated. The focus of the event is to share art, culture and stories from the oldest continual culture on earth via the newest technologies. The Northern Territory Government has been working with AGB Events, curators and producers of the world’s largest light festival, Vivid Sydney, in close collaboration with Central Australian Aboriginal artists. A series of large 1950s-style circle skirts featuring the watercolour artwork of Lenie Namatjira, granddaughter of Albert Namatjira, will be a feature installation of the event. The festival is expected to attract visitors from around the world seeking an authentic and contemporary Indigenous experience.